In the beginning were the trail bikes, civilized off-road motorcycles that were as usable on the highway as in the rough. From that starting point, it was only a short step to the creation of multi-purpose machines with the power of sports bikes. It began with the creation of a wild racing formula. The machines were run over mixed courses that were half dirt trail/half blacktop. On the course, the best riders from three disciplines - motocross, enduro and speed events, confronted one another. For this type of event, very special hybrid motorcycles were evolved, taking their basic concept from motocross and their road equipment from clubman racing: wide-section tires, closefitting front mudguard, large diameter disk brakes and relatively short-travel suspension. Aggressive and endowed with diabolical handling, these racing machines quickly inspired modification kits for trail bikes. 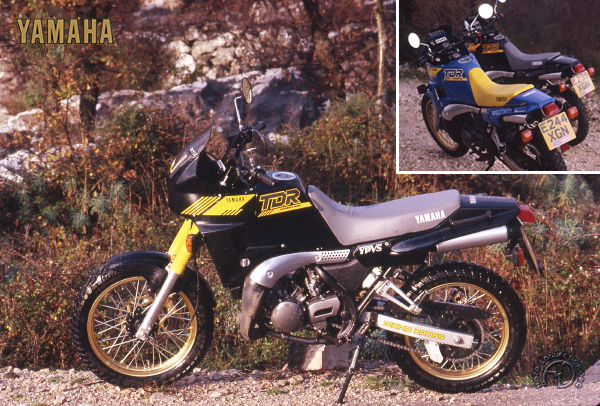 That was all it took to start a fashion and Yamaha, unveiled in 1987 the TDR. The idea was a good one but the Japanese factory was too cautious in limiting itself to a capacity of 250cc, trying to satisfy at the same time its domestic market for under-250cc machines and the strange requests coming from the French market. The TDR was widely applauded for its concept but failed to become a bestseller because of its engine, which lacked muscle. Despite a determined promotion campaign centered on the "TDR Fun Cup, " the TDR 250 failed to make its mark.